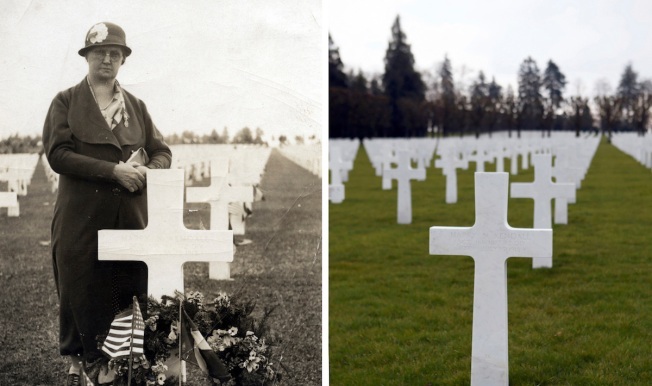 This combo of two photographs shows Estella Margaret Kendall at her son's, Harry N. Kendall, grave located in the Meuse-Argonne American Cemetery and Memorial, in Romagne-sous-Montfaucon, eastern France. It was America's deadliest battle ever, with 26,000 U.S. soldiers killed, tens of thousands wounded and more ammunition fired than in the whole of the Civil War. The Meuse-Argonne offensive of 1918 was also a great American victory that helped bring an end to World War 1. A remembrance ceremony will take place on Sunday afternoon in the Meuse-Argonne cemetery, which is surrounded by green fields and forests in Romagne-sous-Montfaucon, a village in northeastern France. More than 14,000 graves will be lit with candles to honor those buried there. Early Sunday, volunteers began reading the soldiers' names aloud, while others were in charge of placing candles on all the crosses. Covering 52 hectares (130 acres), Meuse-Argonne is the largest American cemetery in Europe. "I think it's important for their teachers, their parents to bring them to these beautiful sites, let them walk through the rose of crosses, let them look at the walls of remembrance, let them go into the cemetery chapels and let them learn the history of what these men did 100 years ago," he said. "It's because of their brave deeds, their acts of valor and courage and commitment ... that these young folks are able to live and enjoy the life that they're living," he added. Pershing said "the success stands out as one of the very great achievements in the history of American arms."